Maybe you are familiar with these names: Rolex, Omega, Armani, Cartier and Breitling. Yes, these are all branded watches. Nowadays watches no longer serve as handy gadgets for telling the time only. It is also a status piece, a symbol of wealth and luxury. Your wristwatch will grab everybody’s attention with your stylish and elegant Rolex or Omega! Having said that, watches are unlike other electronic gadgets. Watches with the most advanced functions and features are not the most expensive and prestigious ones. Old fashion watches such as mechanical Rolexes might be much more expensive compared with these so called advanced watches. In view of this, when Sony Ericsson introduced its Vanguard Bluetooth Watch MBW-100, it didn’t draw much attention from high-end consumers. Selling for about US$399, this Bluetooth watch will give silent alert to users on incoming calls, SMS and time to make call. It also allows its users to check out who is calling on a tiny OLED-display (96 x 16 pixels) that supports only single profile – GAP (plus music player management tools). However, over a period of time, this innovative invention has started to gain popularity. Many users are attracted by good feedback on its functions and features. Technically, this cool idea of incorporating Bluetooth technology and synchronize amongst other electronic gadgets is brilliant and there is room to expand further. 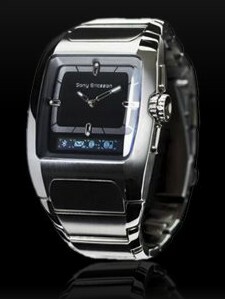 Sony Ericsson’s Bluetooth Watch MBW-100 comes with a stylish look but is a bit heavy in weight, approximately 185g. It is almost twice as much in weight as the phone it is linked to! There are three buttons mounted on the casing, namely two big ones on each side of the clock and the clock winder itself. The analogue watch face with two hands tops the display that stays inactive unless an event occurs. – The watch will vibrate gently when you have an incoming call and the number will be shown in a small but crisp digital display below the main analogue watch face. – Your watch will vibrate when your phone has been placed too far away. The vibration starts at a distance of 30 feet. This function is helpful to alert you to incidences when you might have left your phone somewhere. – Sometimes you are too busy to talk. Stay in the moment by pressing a key to reject or mute an incoming call. Press the button once to mute the ringing signal, and press twice to send the call to voice mail. This Bluetooth watch needs to be charged using an adapter connected to the phone charger. The fully charged battery most probably can last two to three weeks.